A wildlife camera in the Catskill mountains, Shandaken, New York captures a bright orb at high speed. The footage captured on December 13, 2018 shows a wild fox when suddenly a bright orb comes out out of nowhere. The orb phenomenon is surrounded with mystery and is not yet understood. Maybe it is an alien probe, built by extraterrestrial intelligence, but some people believe seeing orbs of light is visible evidence of spirits connected to a higher source. Whether an alien probe or a spiritual entity it seems that those that appear to have their own light source and patterns of travel like the orb in the footage below. 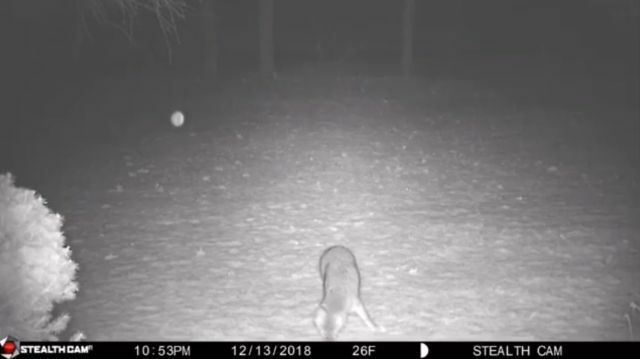 Watch the fox’s reaction as the orb approaches. « OOOPS, DID WE JUST CLOSE AN AIRPORT OVER A UFO SIGHTING?